The daily use of living, fermented, acidic foods prolong life and are a secret to ongoing good health. Fermented vegetables and milk are rich in lactic acid, which inhibits the bacteria that cause putrefaction. Along with many other organic acids, lactic acid also greatly assists people with weak digestive systems (ie most people who are over 40). Sauerkraut combines the health benefits of cabbage and other cruciferous vegetables with the probiotic advantages of the fermentation process. Cabbage and other vegetables turn into a superior probiotic when pickled. Humans have been eating pickled vegetables for thousands of years. As people first moved into the higher latitudes they needed to store food for the sparse, snow-covered winter months. Sauerkraut was a means of preserving cabbage and other vegetables for easy consumption throughout the winter. Historical evidence suggests that workers on the Great Wall of China ate a version of pickled cabbage 2,000 years ago. Lacto-fermented vegetables (sauerkraut, kimchee) store virtually all the benefits of fresh vegetables for long periods. Captain James Cook always took a store of sauerkraut on his sea voyages, since experience had taught him it prevented scurvy among his crew. Sauerkraut provides a high-density source of a wide range of beneficial live lactic acid bacteria which assist in the digestive process, produce a variety of vitamins and other nutrients, and keep harmful micro-organisms at bay. A single serving of genuine raw sauerkraut gives your body a bigger health boost than any of the expensive probiotic drinks and supplements sold in stores. Cruciferous vegetables (also known as Brassicaceae or Brassicas) include broccoli, brussels sprouts, cabbage, cauliflower, collard, cress, horseradish, kale, kohlrabi, mustard greens, radish, rutabagas, turnip and watercress. A phytonutrient in these vegetables named glucosinolate significantly enhances your liver's detoxification ability. According to one study (1), eating these foods every day will halve your risk of getting cancer. Some of the phytonutrients in this family seem to be able to protect mucous membranes, especially in the lungs and digestive tract. They are effective guardians against cancer, ulcers and infections in the digestive tract. Most sauerkraut sold in supermarkets and shops is pasteurised. The beneficial bacteria and other organisms have been destroyed so that it has a long shelf life, and there is no risk of the jar exploding from pressure build-up. To gain the benefits from sauerkraut, it MUST be made the traditional way and consumed raw - best to learn how to make your own. The main disadvantage of cruciferous vegetables is that they contain high levels of goitrogens. Goitrogens are substances that prevent the uptake of iodine by the thyroid gland, and iodine uptake in the rest of the body. Their primary effect is suppressed thyroid function. Our exposure to numerous goitrogens in the environment and in our food is much higher than 50 or more years ago. Fermenting does not reduce the level of goitrogens that cruciferous vegetables contain. Cooking destroys most of the goitrogens in cruciferous vegetables. For example, steaming reduces the goitrogens in cabbage by about two thirds, and boiling cabbage for 30 minutes reduces the goitrogens by nearly 90%. However, you must use RAW INGREDIENTS to make sauerkraut. Fermented foods such as sauerkraut are wonderful in that they provide probiotics and bio-available nutrients. However, consuming large amounts of sauerkraut could actually be harmful to the function of your thyroid, especially if your thyroid is already compromised. I would advise you to monitor how you feel on a diet high in crucifer vegetables. For most people, moderation is the key. It is best to consume fermented cruciferous vegetables as condiments, not as a large part of your diet. Sauerkraut is a wonderful, healthy food when consumed in moderation. To counteract the goitrogens in the cabbage, I add iodine-rich seaweed to my sauerkraut. I also include dill and juniper berries in my sauerkraut as they add a perfect complimentary flavour to the finished product. Shred the cabbage and other vegetables in a food processor. Put the shredded vegetables in a large container or bucket with the other ingredients. Pound them with a pestle or wooden mallet for 10 minutes - long enough to release the juices. Press the mash down. The liquids should just about cover the top of the mash. Put a large plate into the bucket that fits nicely and seals the top, and a heavy weight on top of it. 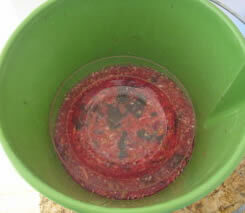 Within a few hours, liquids should cover the top of the shredded mixture (if it did not cover to start with). If there is not enough cabbage juice, add cold filtered water with whey / lemon juice / vinegar to cover. Leave to ferment at room temperature for 3 - 5 days. Within 1 day the smell should start to change, and within 3 days the mixture should have a delicious aroma. After 2-3 days of lacto-fermentation, vegetables start to soften and some of their components break down. As lactic acid-producing bacteria proliferate, the food becomes more acidic and easily digestible. Micronutrients such as choline are formed, the entire medium is preserved, and new flavours and aromas develop. Transfer to capped jars. Leave 2-3 cm / 1 inch at the top as they can bubble and leak. However, try not to expose it too much to the air, as making sauerkraut is an anaerobic process. Sauerkraut may need to be stored in the refrigerator if you live in a hot climate, but most refrigerators are too cold to allow it to mature properly. The ideal storage is about the same as for a fine bottle of wine. Sauerkraut needs at least six months to fully mature, depending on what it is made from; the best sauerkraut I have tasted was eighteen months old. Kahm yeast. Sometimes a white, velvety or powdery looking yeast or scum develops on the surface. It is not harmful, but does not improve the flavour. If it develops, skim it off the surface of the liquid. Discard any solid matter that has it. As usual, your senses are the test - if it smells and tastes OK, it probably is. Your brew is insufficiently acid, especially when you start it. There is not enough salt. Over exposure to the air. If black or blue mould forms, throw the brew away. It usually smells horrible, and you wouldn't want to eat it anyway. Mould forms for the above reasons, and also because there was not enough liquid - the solid matter is left exposed to the air and light, especially during the first few days before sufficient acidity builds up. Only normal kitchen hygiene is required. 1. Adeline Seow, Jian-Min Yuan, Can-Lan Sun, David Van Den Berg, Hin-Peng Lee, Mimi C.Yu. Dietary isothiocyanates, glutathione S-transferase polymorphisms and colorectal cancer risk in the Singapore Chinese Health Study. Carcinogenesis vol.23 no.12 pp.2055-2061, 2002. 2. Kristal A.R., Lampe J.W. Cancer Prevention Research Program, Fred Hutchinson Cancer Research Center, Seattle, WA 98109. Nutrition and Cancer [2002, 42(1):1-9].